As the eBook evolution continues, many publishers are experimenting with meta-fiction and eBooks integrating disparate digital content. NARR8 has released a new episodic, interactive eBook – The Secret City – for iPad and iPad Mini. (Android version will be released soon). 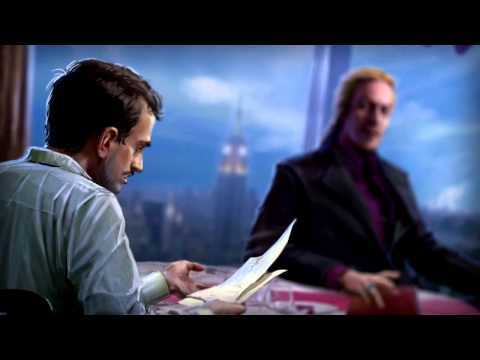 The Secret City, an interactive novel integrating text with animation, sound, and gamification elements, is based on the best-selling and award-winning Secret City novels written by Russian author Vadim Panov. Panov has sold over 5 million books marking him as one of the most popular writers in Russia. In The Secret City magical races of gnomes, elves, witches, and vampires exist but only in the shadows. The story is one of epic war between these mysterious enchanted creatures and the humans who drove them into hiding in a place we know today as New York. In 2001, Panov made his debut as an author with Wars Are Started by Losers, the first novel in the urban fantasy series, “The Secret City” which is comprised of 15 novels and 2 books of short stories. Panov has been awarded the prestigious “Fantasy Writer of the Year” award twice at RosCon, the largest event for fantasy writers and literary agents presented by leading Russian publishing house Exmo. A prolific writer, Panov has authored numerous books that span many genres, including the pentalogy of Enclaves, the mystery series La Mystique de Moscou, and a number of steampunk novels collectively referred to as the Hermeticon. Below is a Q&A with Vadim Panov about the Secret City and the new NARR8 interactive eBook. Were you familiar with the NARR8 platform and content before you were offered to launch Secret City as a series? Yes, and I instantly liked this new approach. In terms of graphic novels, I don’t find classic ones interesting because the ‘graphic’ part overrides the ‘novel’, and I’m a person who fancies text more than art. The art itself is fine, but it’s not something I myself can relate to. But when there’s a good balance between art and text, now there’s something to talk about which NARR8 accomplishes. I believe this is one of the modern paths of development for literature as a genre. It’s not entirely clear as to where this may lead in the future, but it’s certainly intriguing. I like experimenting, and participating in daring new ventures so when NARR8 approached me, I was all for it. In our version of Secret City, several alterations were made to the original plot. For instance, your ‘secret city’ is Moscow, and we changed it to New York. What is your feeling towards these changes? We came to an agreement about this in the very beginning. I understand that someone might be displeased with this change as Secret City is dear to the readers because the city of Moscow itself is dear to them and they like that the story takes place in familiar surroundings. But let’s face it: during the last couple of decades, almost every TV show, movie, musical and so on are modeled after American original series. They buy a license and then create a ‘Russianized’ version, while we, in this case, are doing the opposite: we take something originally Russian and localize it for the Americans. That’s what I especially like about the whole idea. It makes me proud, you know? Do you think the American and European readers will see the Secret City story differently than the Russian audience? I don’t think there’s anything specific about the original that might be hard for the Western readers to understand. Fantasy as a genre is based on things that are universal in our cultures. For instance we all expect a 16-century magician to live in the middle of a wild forest, and a 19-century magician to live in the forest near a city, because people gradually moved to the cities, and their reality shifted. Well, now we all live in cities, so a modern-day magician is bound to live among us. But it’s all part of the same mythmaking tradition. There’s a different trend now within the urban fantasy genre with its vampire stories. Take the Twilight saga or Lukyanenko’s Watches; they are influenced by secret societies, as with other mediums like the Masons, conspiracies of world leaders. These are stories that occupy our minds nowadays. So if you write about someone scheming to rule the world, about wars between some mysterious powerful groups, it all feels very ‘natural’ to the readers, because these are the things that you subconsciously suspect are true about the world, like our ancestors subconsciously believed in fairy-tales. As for the Secret City, however, things are a bit different: it’s a story about a group that doesn’t really care all that much about people. I mean, there are reasons why they can’t destroy us, but if people were to disappear from the planet as a race, the inhabitants of the Secret City would probably just breathe a sigh of relief. Who would you say is the target audience of your books? And do you think the image of your average reader might change after Secret City’s appearance on NARR8 considering that even schoolchildren nowadays own iPads? When I was a beginning author, I was under the impression that my readers were mostly young people: teenagers, students, maybe some college graduates. But then I discovered that wasn’t true. If your book is worthwhile, it’s beyond age. iPads and other tablets are owned by people of all ages, not just teenagers. Many adults use them, not necessarily for entertainment purposes. For instance, a tablet may prove very useful when you’re traveling. Still, if you own one, you’re likely to become interested in all the options it has to offer. So I think all sorts of people might be interested in NARR8. It’s something new; people enjoy exploring new things. And from then on, it all depends on the quality of your stories. If they’re good, then the audience will stick with you. Do you think that fantasy and sci-fi writers might be interested in creating stories exclusively for NARR8? Next year it’s going to become possible for any content creator. That really depends on what writers you are talking about. We’re not all the same, you know. Some people, even some young people, were brought up on classic books. The very concept of storytelling and plot development there is very different from what NARR8 requires from its authors. And those people might not be able to adapt to the new format. Your narrative methods will feel foreign to them, the way you split the story into episodes and the way you present the story itself. I’ve worked with some people who write screenplays for major movies—they are very different from literature writers. They handle the plot in a much more sharp, precise, urgent kind of way, so that the film director will instantly understand what they mean. It’s also important to realize that NARR8 is a whole new genre that has yet to be developed. Its rules aren’t yet set in stone. So who knows, maybe eventually there will be a way even for old school writers to create series for the platform without altering their perception of text too much. Do you think we perceive information differently from our ancestors? Does the 20-30 minute episode format somehow reflect the way we understand stories? Of course. The pace of modern life is nothing like the pace of the 18th or the 19th century. When classic literature emerged, things were very relaxed. For instance, take Radishchev’s Journey from St. Petersburg to Moscow. The whole book is about a month-long trip. And the book itself was something you could read while embarking on a similar journey. Because, you know, you needed a way of killing the time. Eventually the rhythm of things got faster, especially as cities developed. In this sense, it is only logical that the pace of modern storytelling is different from how stories were told two centuries ago, and our perception of these stories is different too.